RADIESSE® (+) is manufactured by MERZ AESTHETICS™ and is an opaque dermal filler that contains calcium-based microspheres suspended in a water-based gel carrier that comes in a 1.5 ml syringe premixed with 0.3% powdered lidocaine. It contains no animal proteins and does not require allergy pre-testing. This product works in two ways. The gel carrier gives an immediate correction. The calcium-based microspheres act as a scaffold, stimulating your body to produce its own natural collagen. Over time, the gel carrier is absorbed and the calcium-based microspheres are metabolized by your body, leaving behind the newly created collagen. Unlike hyaluronic acid dermal fillers, RADIESSE® (+) cannot be dissolved with an enzyme. RADIESSE® (+) has the same precautions as other dermal fillers with three exceptions. The calcium-based microspheres are visible on CT scans and may be visible in standard plain radiography. It is advised to tell your treating physician or radiologist that you have had RADIESSE® (+) injected in your face before any radiological studies are performed. The second precaution is that RADIESSE® (+) has been known to activate herpes simplex and shingles in patients. Appropriate treatment should be started if any symptoms arise after an injection procedure. The third precaution is that RADIESSE® (+) should not be injected around the eyes or in the lips as the formation of nodules may occur in these areas. RADIESSE® (+) can be used in multiple areas on the face. It can be injected deeply to lift and augment the cheeks, temples, chin and pre-jowl area. It can be injected more superficially for nasolabial folds, marionette lines and chin creases. A treatment with RADIESSE® (+) may result in a correction lasting a year or longer. RADIESSE® (+) received FDA approval for Hand Augmentation to correct volume loss on the dorsum (back) of the hands. It is injected under the skin of the dorsal surface of the hands to lessen the appearance of visible veins and tendons due to volume loss. The result is a more youthful appearance to the back of your hands. In 2006, RADIESSE® was approved by the FDA for the treatment of Facial Lipoatrophy associated with HIV. MERZ AESTHETICS™ has a Patient Assistance Program for patients with Facial Lipoatrophy associated with HIV. This program is available for HIV patients on a limited income without insurance that would cover a restorative procedure. From our office, a simple form for this program can be filled out and submitted with proof of income. Once accepted into the program, a patient will be able to purchase up to six 1.5 ml syringes of RADIESSE® per calendar year. The syringe cost varies depending on a patient’s income. A patient is requested to cover the cost of the syringes prior to ordering, and there is an injection fee per syringe charged at the time of a treatment. The syringes do not have to be ordered all at once but can be ordered several at a time during the course of the calendar year up to the six allotted. Usually, a patient will use two to four syringes on an initial treatment to restore and correct volume loss in the face. The remaining syringes can be used over the course of the year to maintain the correction. 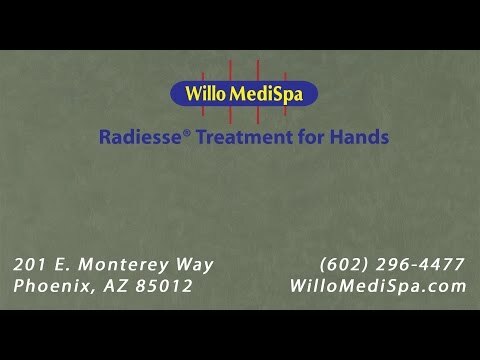 Schedule a Complimentary Consultation with Willo MediSpa in Phoenix to discuss RADIESSE® (+) by calling 602-296-4477 or by contacting us below. We’re gonna do this with Radiesse® and this is our product, see it? And here’s our syringe, right. So see these little groove here, here and here, and in here. So I’m going to put a little burst of product in here, in here and in here. I’m going to go around so I don’t hit the vein, and just under the skin. See that pop in there. It’s going to look like a bolus of products, it’s going to sit there for right now. I’m going to come back and I’m going to move it around. It’s pretty simple because you just you can see everything everything because the skin of your hand is thin, and I can make sure I’m not hitting anything. So if I was injecting and I saw one of these blue veins start to look different I would know I’m having a problem right so I wouldn’t keep injecting there. I’m going to put a little bit more right down here. Okay, so there’s our syringe. Now we’re going to do is we’re going to massage it in. Now, see how it moves around. You want to keep a gentle even pressure on them. All ready. See the difference? Yeah, definitely. Now, when I come back at five-thirty, we’ll take a look at it and we’ll show, you give it another massage. So your hand might need more than one syringe? Yeah. But you wouldn’t really necessarily do two syringes, right away. No. So, you would think about waiting a little bit and coming back before it’s all gone and then adding a little bit more on top of here. so you do it in stages. Four and a half hours, so, how would you describe that hand now? Seventy-five percent improvement I’d say. Okay, so you think you still need more in there? Maybe. A little bit more. Okay. So we talked maybe down the road you might come back for a little more? Yeah. Okay. So, now this hand, so we still think it’s around a three to four grade right somewhere between. Okay and you ready? Yes, I’m ready. we’re using the same product, RADIESSE Plus. I didn’t even feel that. See how that actually not just stays in the hollow here, but it goes over the the tendon a little bit, too. So, see here this is right up to here, so, I’m going to go down here to inject it so don’t get near that vein. If I can get my needle in here. Going to get some more in here. You can’t clearly see where that vein is, totally miss it. What will happen if you went through a vein? You do not want to put a product in the vein because it was a plop to vein. And now, we basically just smooth it out. How’s that look? That’s good, but you know what this one improve at the afternoon. As it sat you look a little bit better? Yes. So now we know what it looked like right away and four hours later you’re saying it even looked a little bit better. Yes. Good so now we have a before both and an after one, after several hours, the second one to compare to right away, and probably I should ask you to come back in next week? Are you to come in for a shot? Probably, yeah. Then we’ll do another little quick shot of this so we can have look at it like a week later see how they looked in.